If it all seemed very angry, then that was quite intentional: had this been a piece of classical music, it might well have been called ‘Variations on a Theme of Anger’. Variations is the operative word. Far from being merely different shades of “Heav’n has no rage, like love to hatred turn’d / Nor hell a fury, like a woman scorn’d” (William Congreve’s The Mourning Bride, Act III, Scene VIII), this production is something of an eye-opener in terms of how not only anger but anxiety and frustration can be expressed. Sometimes, it can be rather fun, or at least unusual. In ‘A Discontented Honk’ by Brenda Callis, a woman stands on the pavement with a large red sign around her neck reads ‘HONK!’, without stating the reason why anyone should, but sure enough, people do. Ironically, the speed of the passing traffic means she is seldom able to gauge the reactions and facial expressions of the honkers. Read into this exercise what you will: it appears the lady’s friend, Laura, has ‘ghosted’ (that is, suddenly ceasing all communication without explanation) her for a week, before just as suddenly reappearing to apologise and rekindle their friendship. It’s certainly a cry for attention, and taken literally, it works. Undivided attention is not always a good thing, however. In ‘The Creep’ by Rosie Harris, a commuter is on a train, and for once how late it is running is a rather moot point in the context of the story. There may be an element of paranoia in the thought processes of this lady who is just trying to get to work, but is being stared at by a man who, she thinks, is eyeing her up and has the sort of thoughts about what he would like to do to her that are better left unsaid. There’s no getting away from the fact that it is just plain weird to stare at someone one doesn’t know for some minutes. Here, as in a few other pieces, the tone is accusatory, and I don’t think there are any off-stage male characters who come out well. And yet I never got the feeling that the production was ever asserting that there is no such thing as a man with any redeeming features, or indeed that all women are, to paraphrase Mary Poppins, practically perfect in every way. These are personal stories about specific circumstances. The audience is subjected to some horrifying narratives. A short film, ‘Morning Routine’ by Erin Karn, talks about campus life at university, and a group of male students who accost a first-year student on her own. In ‘Reverence’ by Julia Thurston, what I assumed to be a life model is in conversation with a man doing a portrait of her. In ‘Table Nine’, a restaurant worker is unhappy with the way in which a man is glaring at her. in both cases, the women are constrained by how they can respond by a need to maintain professionalism. Nothing wrong with that in itself, but stories like these make clear that, at least in some cases, certain forms of behaviour continue in certain contexts because it has not been condemned in the strongest possible terms in those said contexts. Every so often, the production raises a laugh, even pandering to the sort of red-bloodied male that the show so regularly does its best to portray in the worst possible light. “The suction power is phenomenal!” the audience is told in ‘Spilt Milk’ by Josephine Partridge, in which a young mother refers to breastfeeding her baby (as opposed to bedroom activity). Then there was ‘Drink’ by Alexandra Lewis – although it begins with a portrayal of binge-drinking in modern Britain straight out of the tabloid papers, some of the reasons why younger women turn to alcohol in this way are gradually revealed. There is, I suppose, an element of preaching to the choir, inasmuch as certain (ahem) people who would benefit most from seeing a production like this probably aren’t exactly forming an orderly queue at the box office. That’s their loss. An eclectic and entertaining evening. We wondered, why do we apologise for our anger? Why do we try to be polite? Refined? respectful? What forms can a woman’s anger take? And how can it be expressed through performance? 12 Writers who identify as Women have come together to present their interpretations of Anger. A night of comedy, spoken word, physical performance, song and ultimately a coming together of different voices to send a polyphonic message. 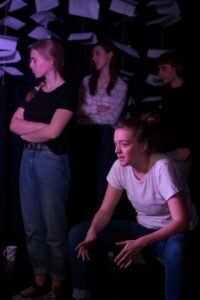 Book tickets for what promises to be an engaging night of Theatre, bring your Mother, your Sister, your Landlady and celebrate Women’s voices at the Bread and Roses this January.